When families come to Branson, the Haygoods show is a must-see! The Haygoods began their journey in Branson about 25 years ago. All of the siblings are very talented both instrumentally and vocally. On top of that, they are extremely talented in show production. In fact, the Haygoods show sold-out over 75 times last season! 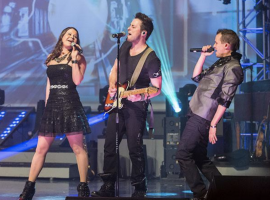 The Haygood’s show is a blend of country, rock, pop, and more! There is a mixture of songs in the show that every age group will enjoy. From fantastic instrumental solos to outstanding vocals, the music is phenomenal. Catherine plays the most instruments out of all of the family. Her performance on the harp is absolutely beautiful. Also, keep an eye out for Banjo Boy and enjoy the fantastic sounds that he is able to create with his instrument. The special effects that go along with the music are amazing! The spectacular lighting adds even more to this incredible show. Watch as moving images are projected onto bright white instruments. With all of the special effects and laser lights, guests will be eager to come back again and again to see what this family will think of next to incorporate into their show. On top of performing their show, The Haygoods also record original music. They recently released an album called “The Lucky Ones” and you will definitely want to check it out! If you are looking for a show that the entire family will enjoy, check out the Haygoods!